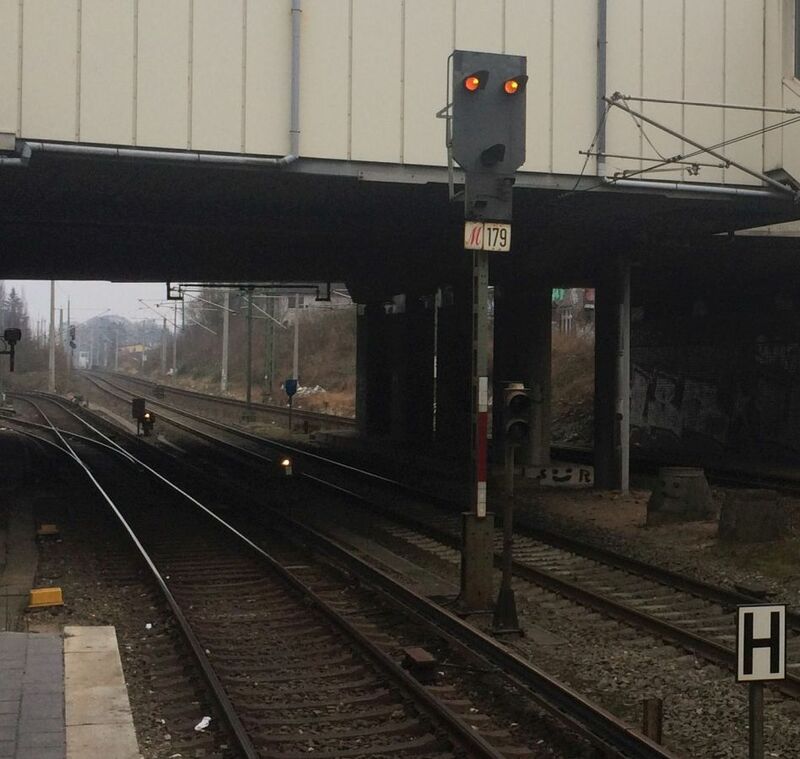 This Sv-signal at Hamburg Hbf shows Sv 6: medium speed, expect stop. 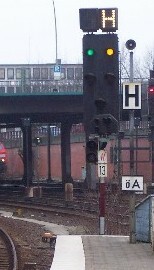 Above is a Zs 2 (route indicator) showing "B": Berliner Tor-Bergedorf. Below the signal there is an M-Board allowing the driver to pass the signal at danger on verbal order, the 13 is the signal number plate. Below you see a white-red-white post plate. Sv 1: clear, expect clear. The destination indicator on top shows that the route is set towards Berliner Tor-Bergedorf, an "H" would indicate Hammerbrook-Harburg. Below the main head we see an M-Board, the signal number plate and the post plate, to the lower right there is the H board telling the driver where to stop. The white T immediately below the main head shows that the driver should close the doors now. A few seconds later: the green ring is a Zp 9 telling the driver to depart. 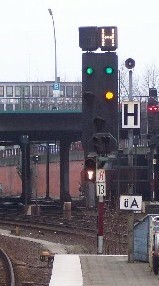 The route is set toward Harburg as indicated by the direction indicator. The signals displays Sv 2: clear, expect stop as the next signal is not at clear yet. The same signal a few moments later: Just before the driver received the instruction to close the doors, the next signal changed to "clear with 40 km/h", so the right half of this signal (being the distant signal for the next one) changes from yellow to green-yellow. The signal now displays Sv 3: clear, expect slow. Sv-signal showing Hp 0: stop. 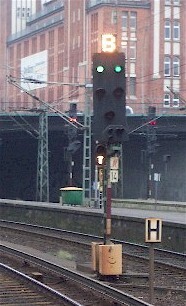 Note that the lower small two red lamps are also on displaying Sh 0: stop for shunting movements. In former times Hp 0 didn't mean stop for shunting movements, now it does so the Sh 0 is really obsolete here. But DBAG didn't want to spend money on rewiring the signal box. 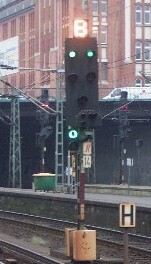 The signal at Dammtor shows aspect Sv 0 (stop then proceed on sight) shortly after a train has left. To speed up operations, many Sv-signals guarding occupied blocks do not show red (stop and stay). 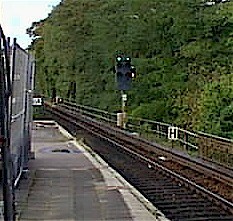 The same signal shows aspect Sv 1 (clear expect clear) as the next train is standing at the platform. The small white light to the right is a white T ordering the driver to close the doors. Soon the T will go out and a green ring (Zp 9-depart) will light. Another Sv 1. The white bar indicates that the next signal is at reduced distance.